SecurityMetrics PCI 3.0 solution simplifies, syndicates, and standardizes. UPDATE: As of April 2016, PCI DSS 3.2 is the latest standard. Read more about the 3.2 updates. We made a bunch of great changes to our customer PCI validation portal to accommodate for PCI version 3.0. Even though PCI 3.0 brings about new standards, longer SAQs, additional scanning requirements, and complex answering options, we kept it simple with our new portal. Below you'll find a list of some new features to our portal as they relate to PCI DSS 3.0. Pre-populating SAQ answers.Even though PCI DSS 3.0 requires all merchants to re-scope, SecurityMetrics will save and populate existing customers' applicable PCI DSS 2.0 Self-Assessment Questionnaire (SAQ) answers to their PCI DSS 3.0 SAQ to ensure a smooth transition. Combination SAQs for merchants with multiple processing methods.In PCI DSS 3.0 SAQs are applied per processing environment, which could mean many merchants' validation types will change, even if their processing method hasn't. It also means merchants may be required to fill out multiple SAQs. 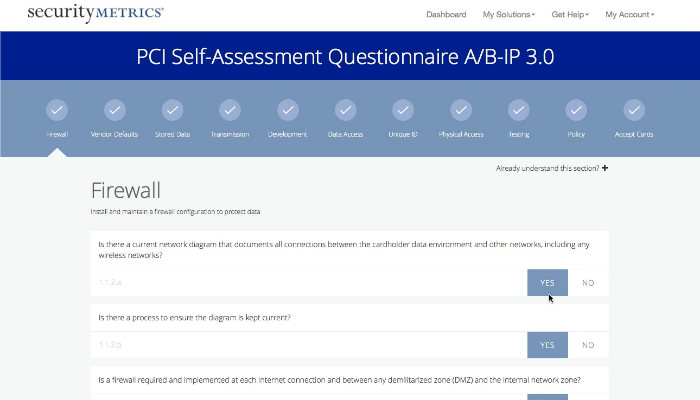 SecurityMetrics' PCI DSS 3.0 validation portal intelligently combines multiple SAQs, deletes duplicate questions, and syndicates questions to avoid confusion. A prioritized compliance to-do list.Oftentimes, merchants are left not knowing the next step to finish compliance validation. The actionable to-do list keeps them on track to ensure a straightforward PCI DSS experience. Simplified language for select standards.The PCI DSS is written in a very technical manner that some merchants may not fully understand. To ensure merchants have the ability to accurately and honestly answer their self-assessment questions, SecurityMetrics offers both simplified and original SAQ questions for select standards. Here’s a sneak peak into the coolest new features. Even though PCI DSS 3.0 requires all merchants to re-scope, SecurityMetrics will save and populate existing customers' applicable PCI DSS 2.0 Self-Assessment Questionnaire (SAQ) answers to their PCI DSS 3.0 SAQ to ensure a smooth transition. In PCI DSS 3.0 SAQs are applied per processing environment, which could mean many merchants' validation types will change, even if their processing method hasn't. It also means merchants may be required to fill out multiple SAQs. SecurityMetrics' PCI DSS 3.0 validation portal intelligently combines multiple SAQs, deletes duplicate questions, and syndicates questions to avoid confusion. Oftentimes, merchants are left not knowing the next step to finish compliance validation. The actionable to-do list keeps them on track to ensure a straightforward PCI DSS experience. The PCI DSS is written in a very technical manner that some merchants may not fully understand. To ensure merchants have the ability to accurately and honestly answer their self-assessment questions, SecurityMetrics offers both simplified and original SAQ questions for select standards. Learn more about how we simplify PCI compliance for small businesses, or request a full demonstration of the new portal.